Scholars regard the March on Washington Movement (MOWM) as a forerunner of the postwar Civil Rights movement. Led by the charismatic A. Philip Randolph, MOWM scored an early victory when it forced the Roosevelt Administration to issue a landmark executive order that prohibited defense contractors from practicing racial discrimination. 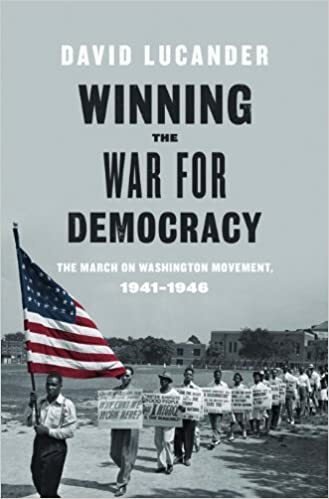 Winning the War for Democracy: The March on Washington Movement, 1941-1946 recalls that triumph, but also looks beyond Randolph and the MOWM's national leadership to focus on the organization's evolution and actions at the local level. Using personal papers of MOWM members such as T.D. McNeal, internal government documents from the Roosevelt administration, and other primary sources, David Lucander highlights how local affiliates fighting for a double victory against fascism and racism helped the national MOWM accrue the political capital it needed to effect change. Lucander details the efforts of grassroots organizers to implement MOWM's program of empowering African Americans via meetings and marches at defense plants and government buildings and, in particular, focuses on the contributions of women activists like Layle Lane, E. Pauline Myers, and Anna Arnold Hedgeman. Throughout he shows how local activities often diverged from policies laid out at MOWM's national office, and how grassroots participants on both sides ignored the rivalry between Randolph and the leadership of the NAACP to align with one-another on the ground.